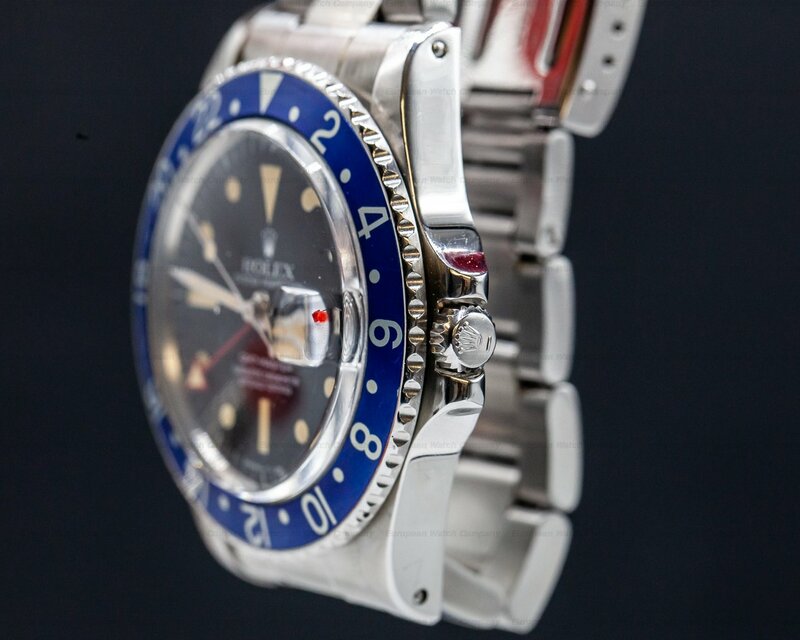 31342 Rolex 1675 GMT Master "Blueberry" MKIII Radial Dial with all red GMT hand, stainless steel on a stainless steel 78360 Oyster bracelet with 580 end links, automatic, stainless steel case is in excellent condition, date, caliber 1575, second time zone with bi-directional 24-hour bezel, all-red 24-hour hand, COSC, black dial is in original unaltered condition with gorgeous luminous patina that has aged uniformly, very rare all blue "blueberry" bezel is in excellent outstanding condition, serial number: 517XXXX (1978), diameter: 40mm, thickness: 12.5mm. 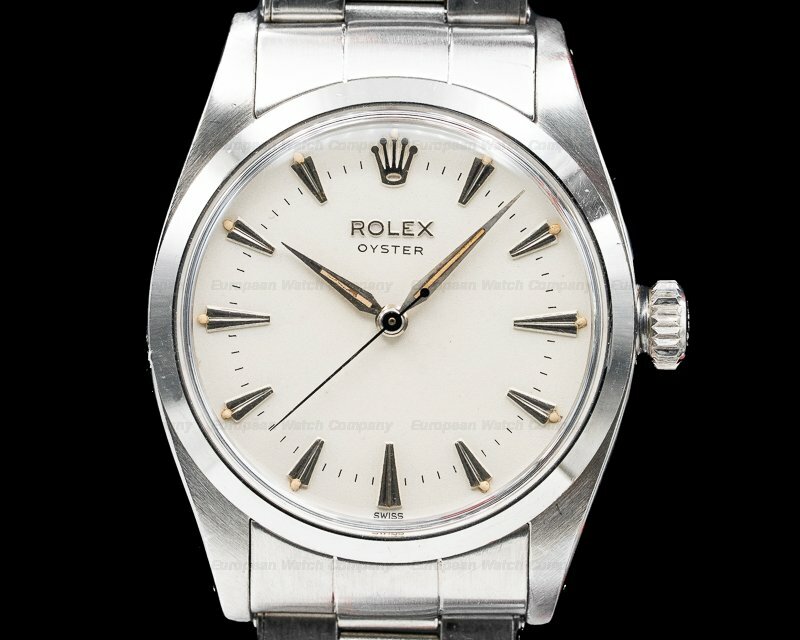 Excellent Original Condition with EWC pouch and 6-month warranty. 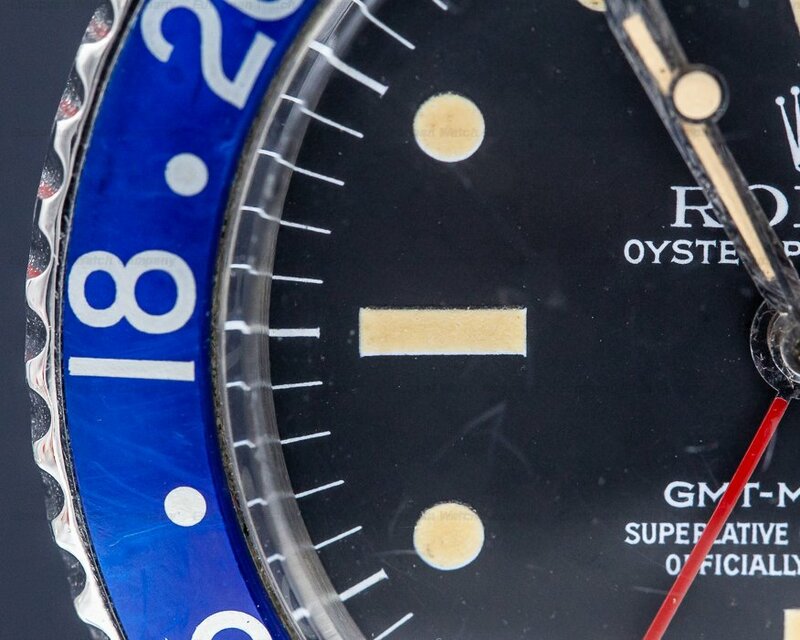 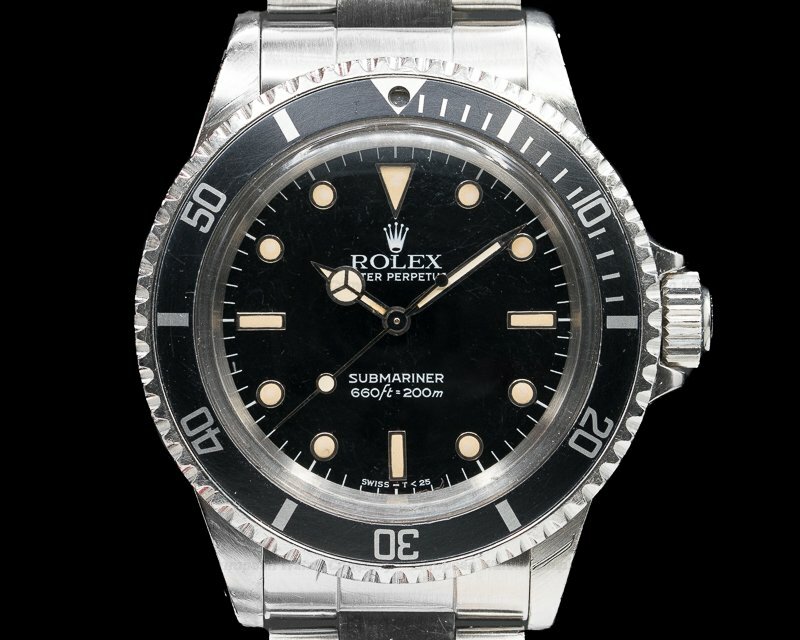 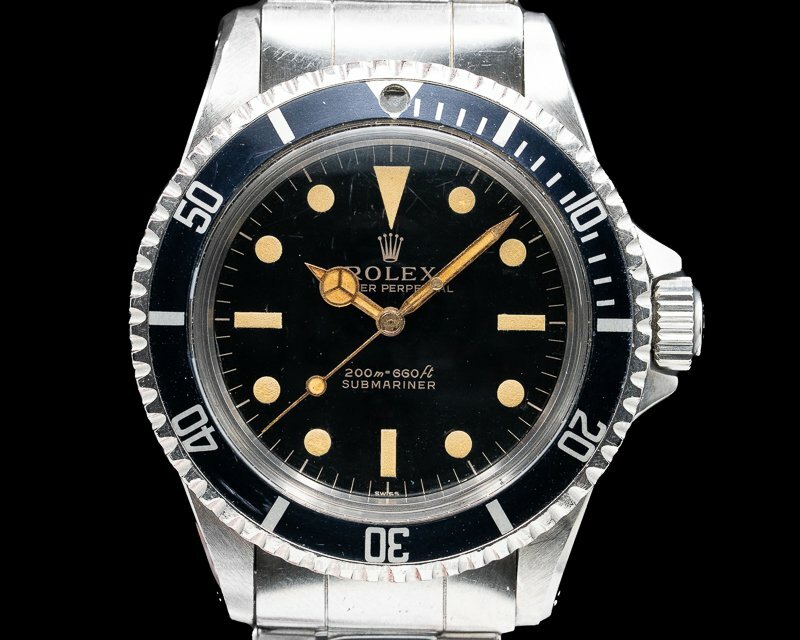 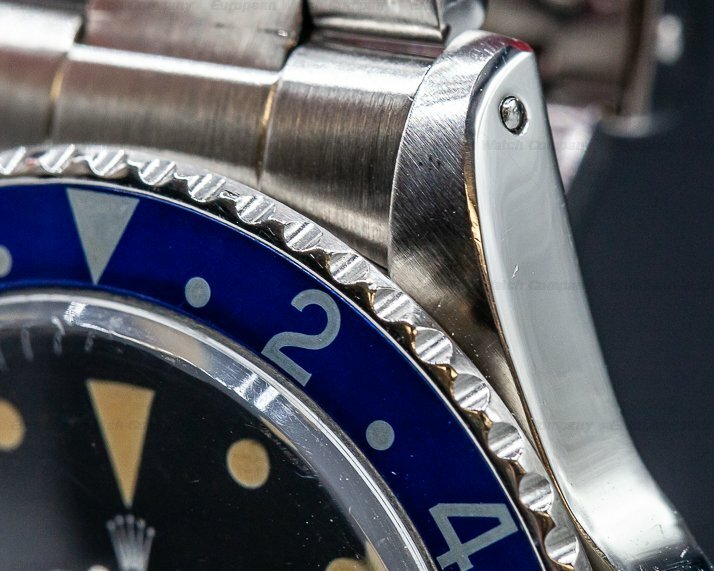 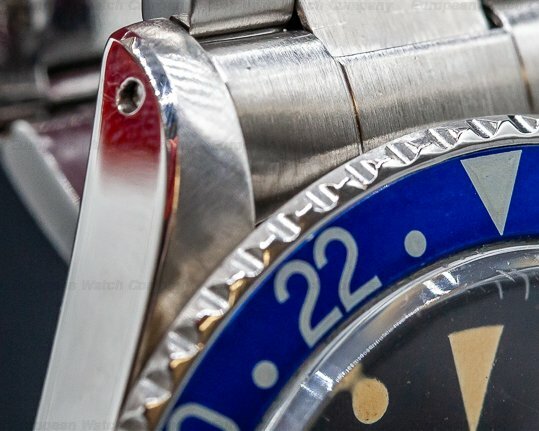 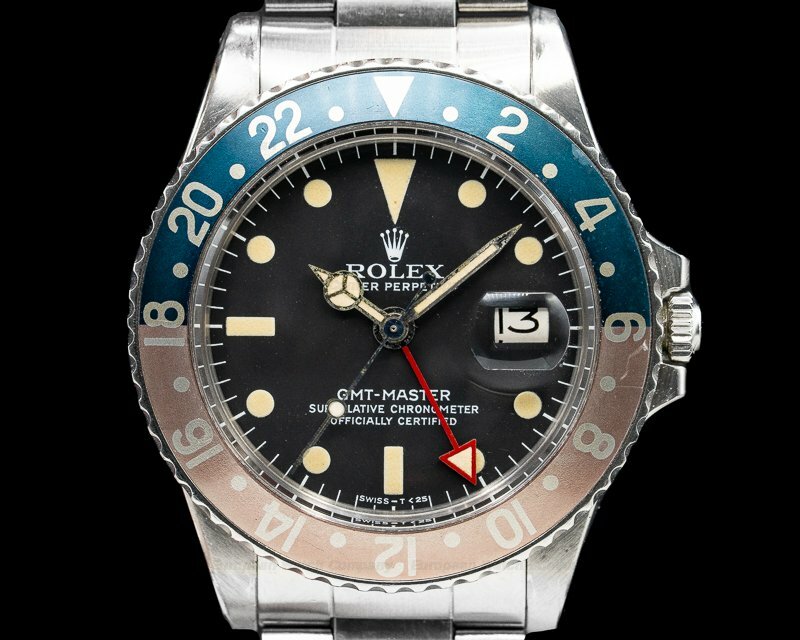 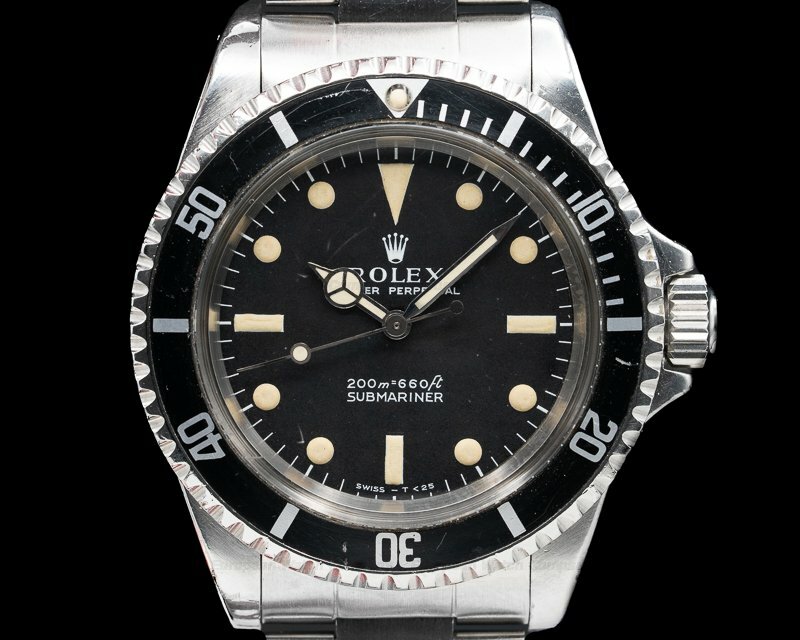 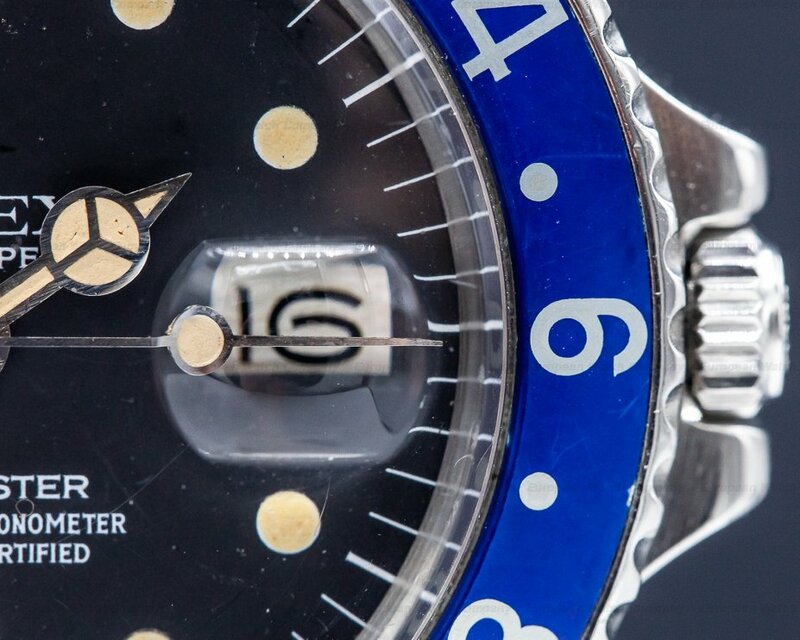 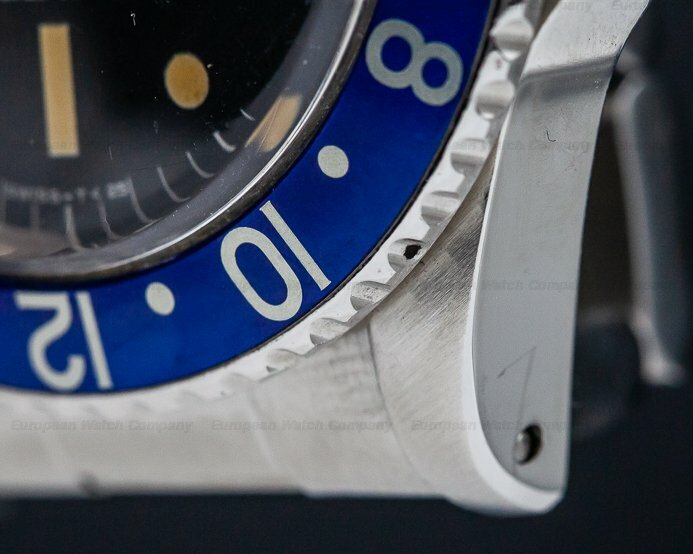 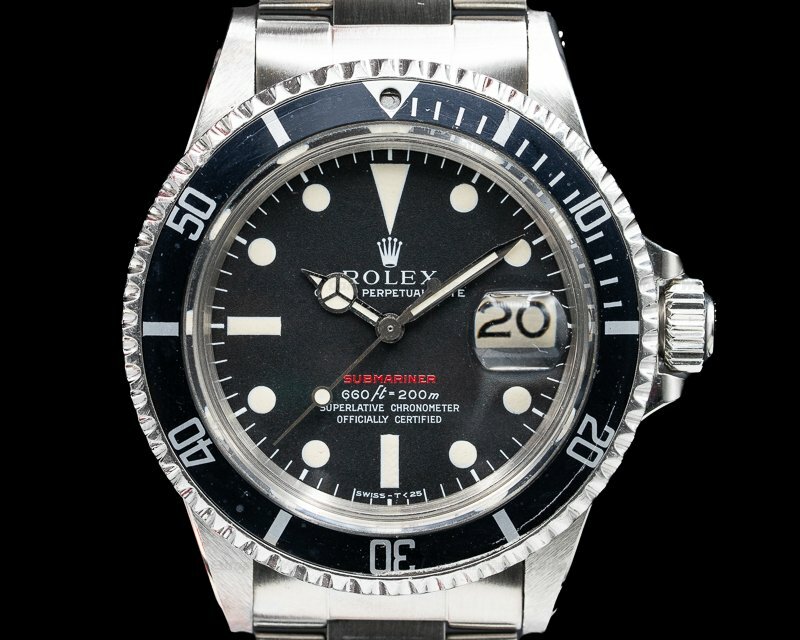 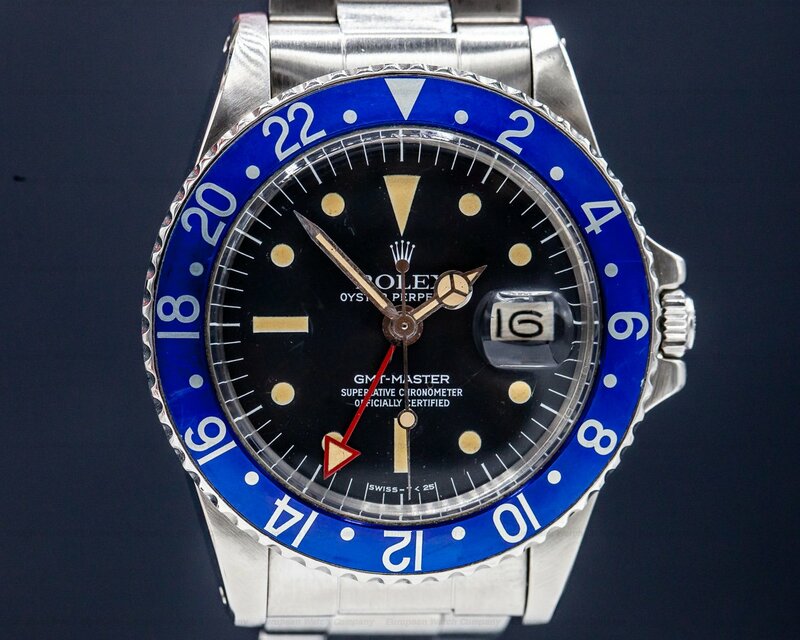 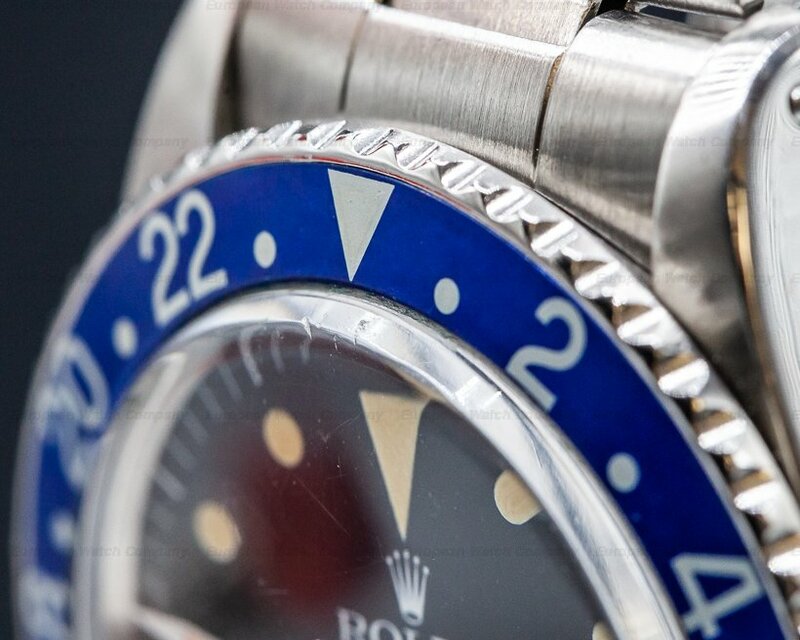 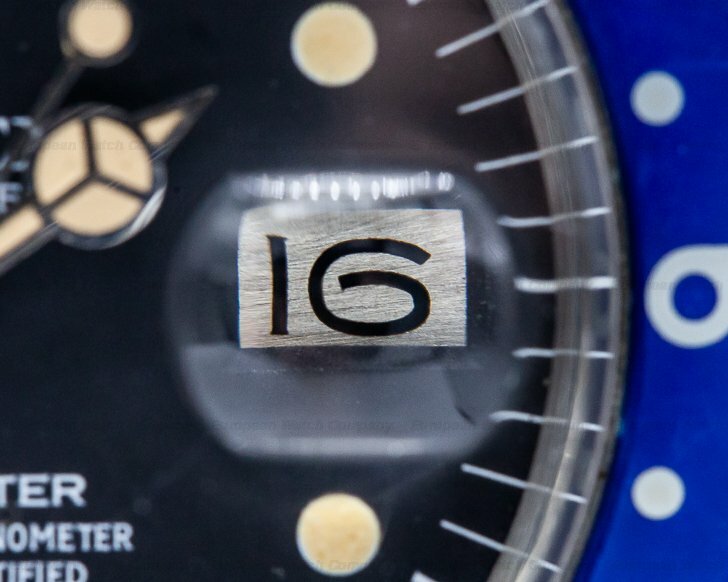 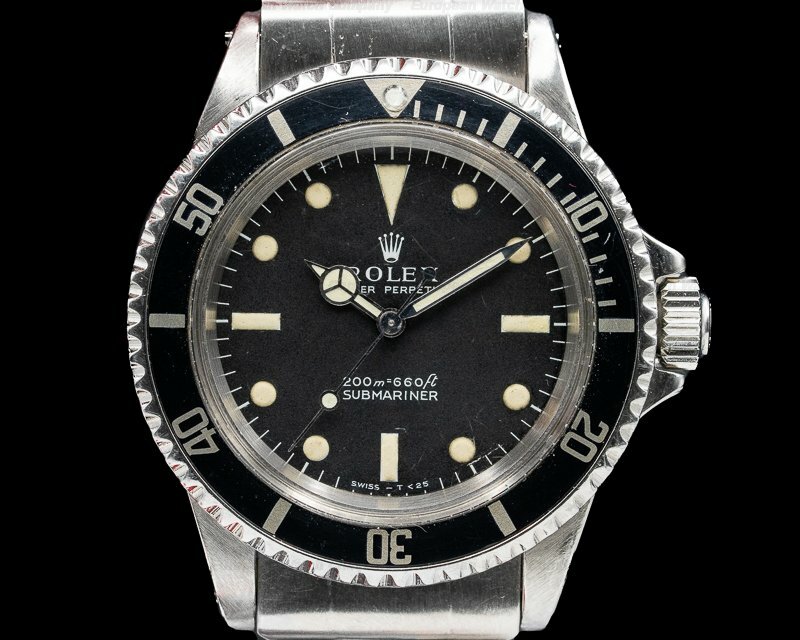 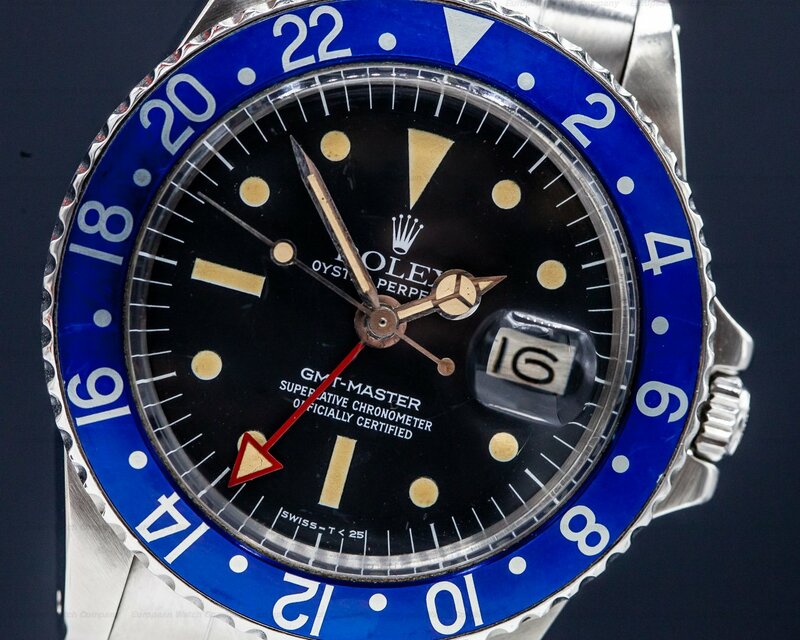 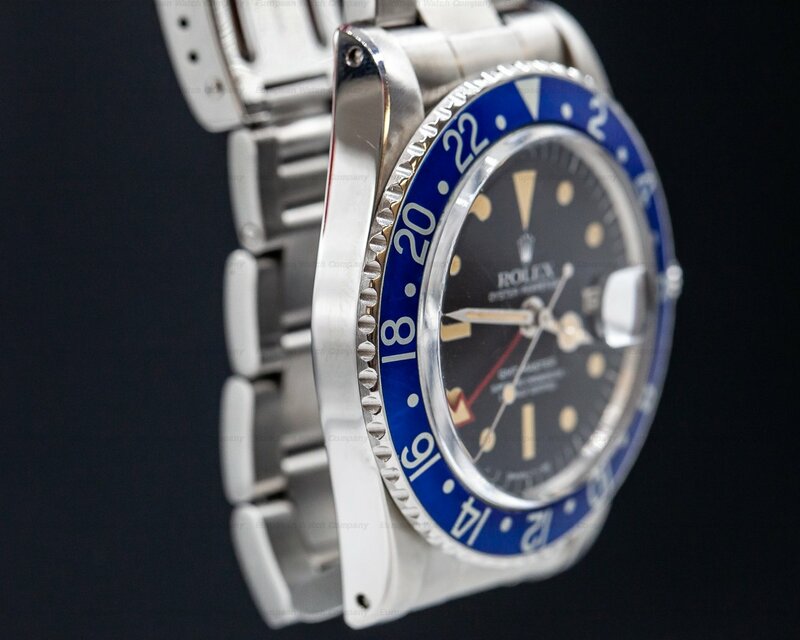 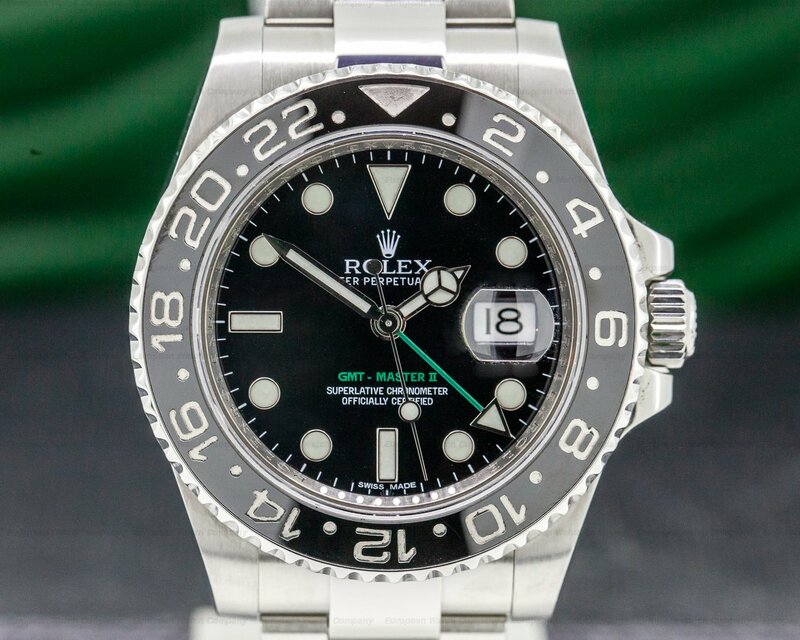 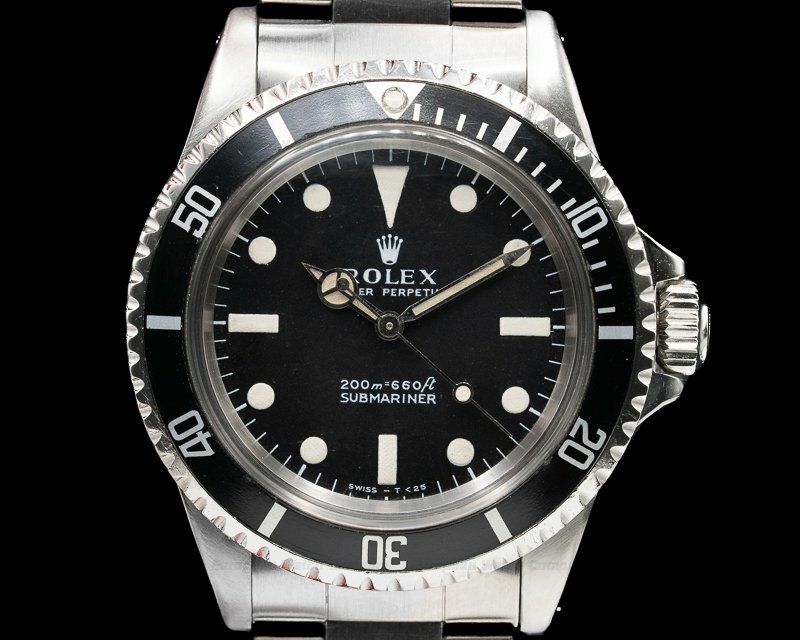 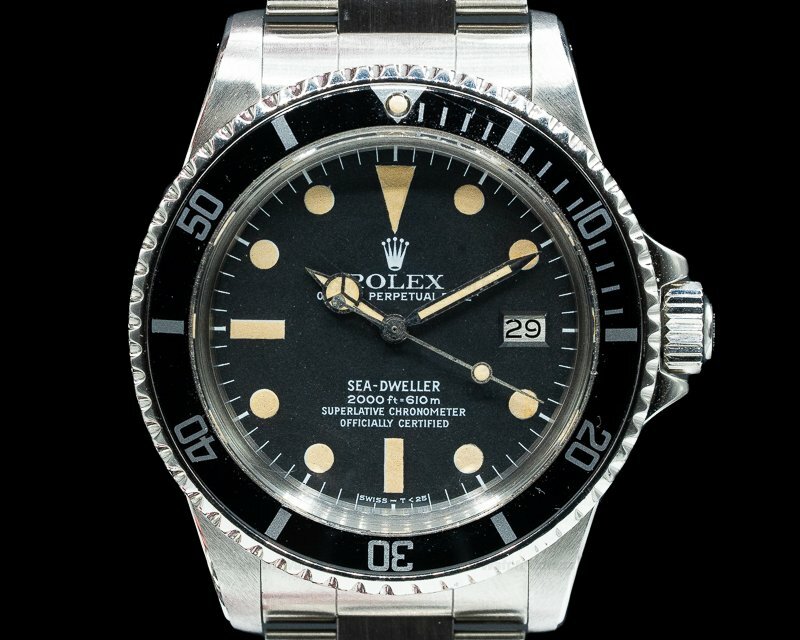 This is a vintage 1978 stainless steel Rolex GMT Master "Blueberry" 1675 with a Mark III radial dial. 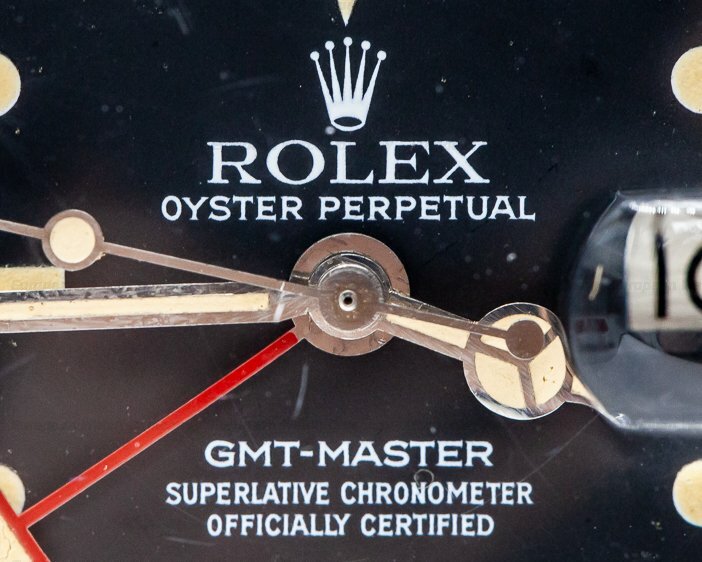 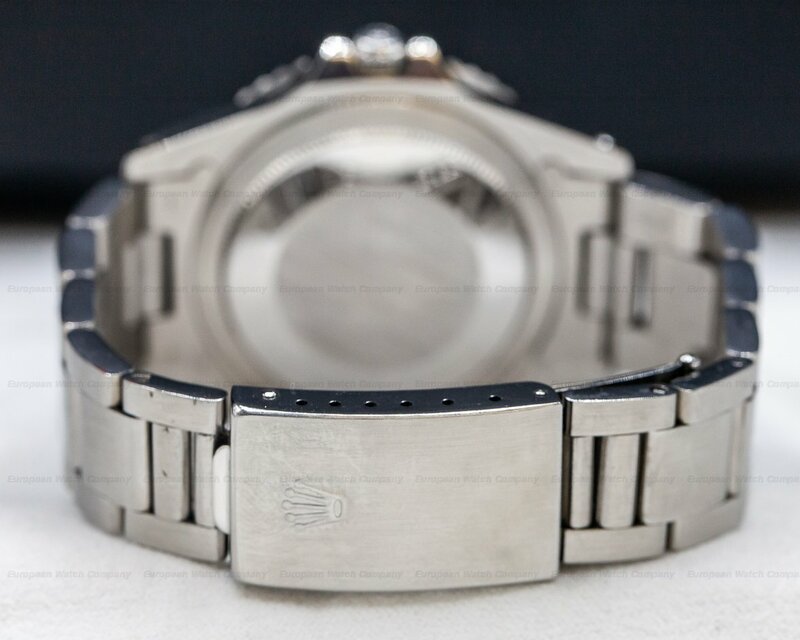 It has an integral stainless steel 78360 Oyster bracelet with 580 endlinks, a double folding deployant clasp, and an acrylic crystal with a Cyclops magnifying bubble over the date aperture window at the 3 o'clock position. 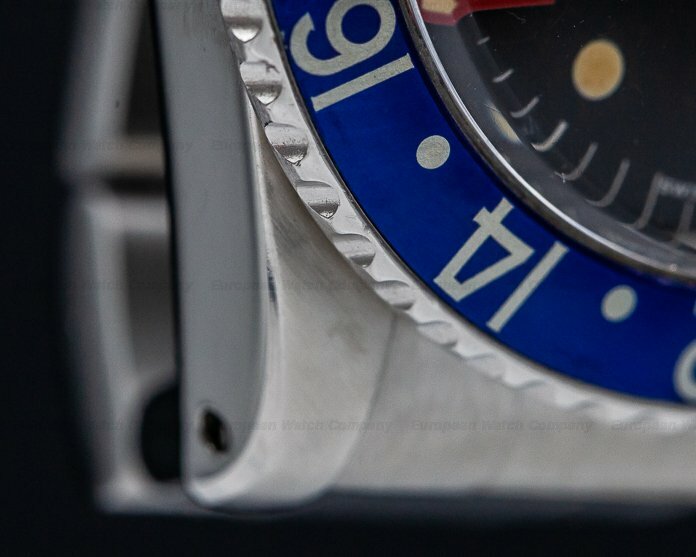 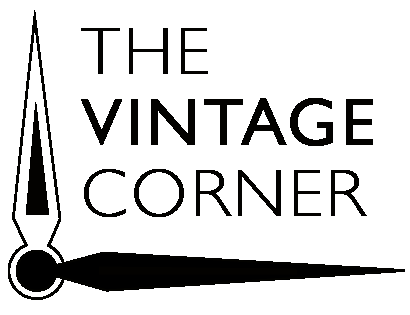 It has a bi-directional rotating 24-hour blue bezel, a solid screw-down case back, and a protected screw-down winding crown. 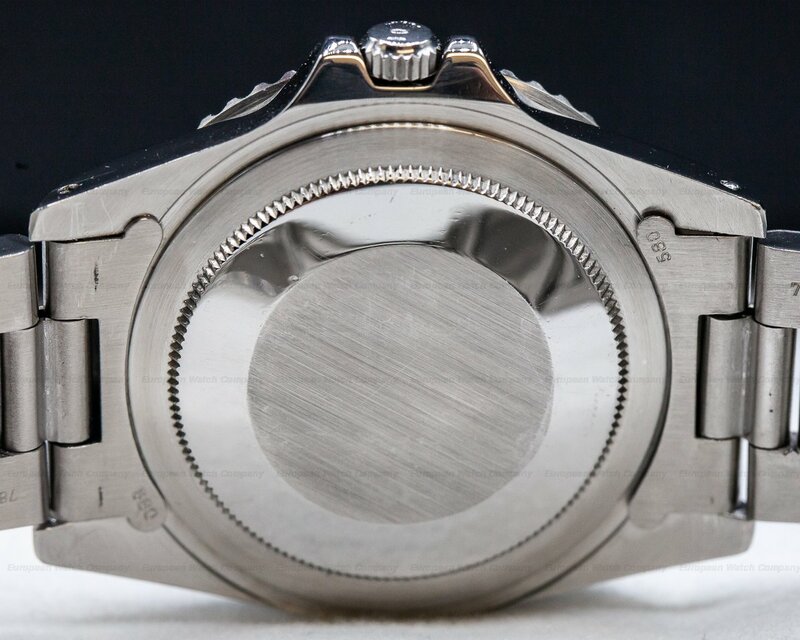 The 40mm diameter solid three-body case, integral lugs, knurled bezel rim, and bracelet are polished/brushed. 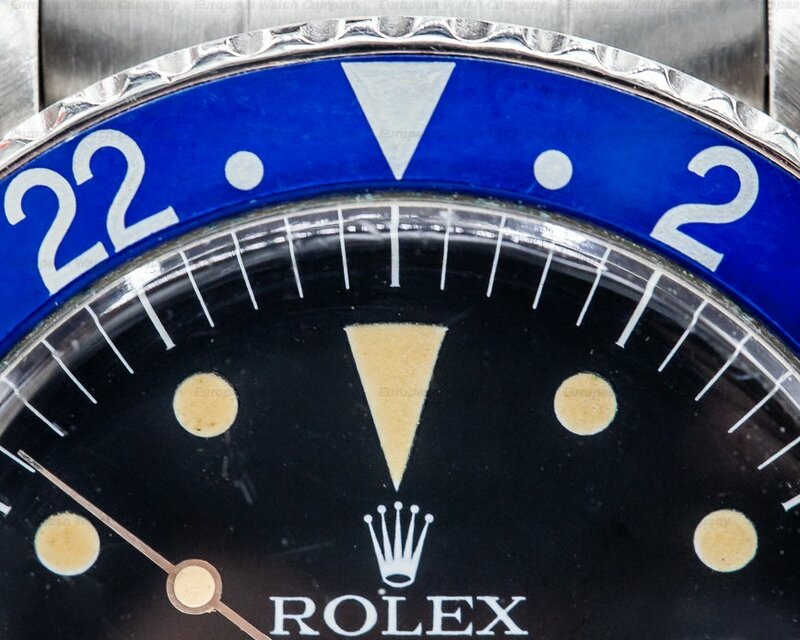 It has a matte black dial with luminous dot, baton and triangle hour markers and luminous Rolex "Mercedes" hands all with beautifully aged lume. 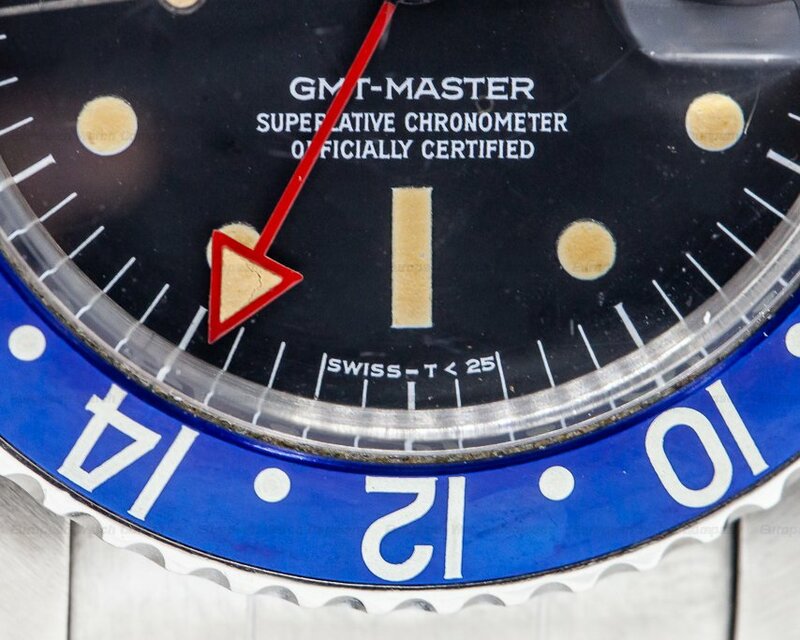 There is an all-red central hand with a luminous arrow tip for the second time zone, and a sweep center seconds hand. 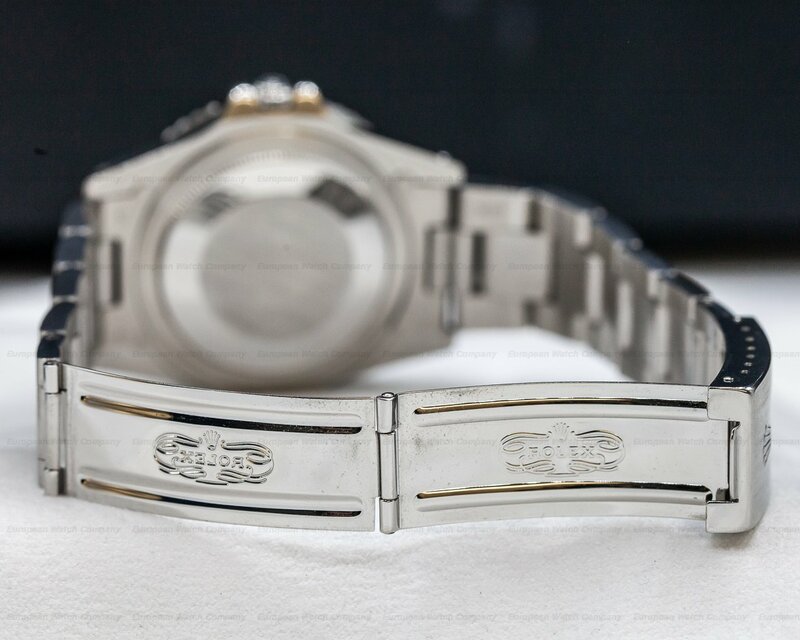 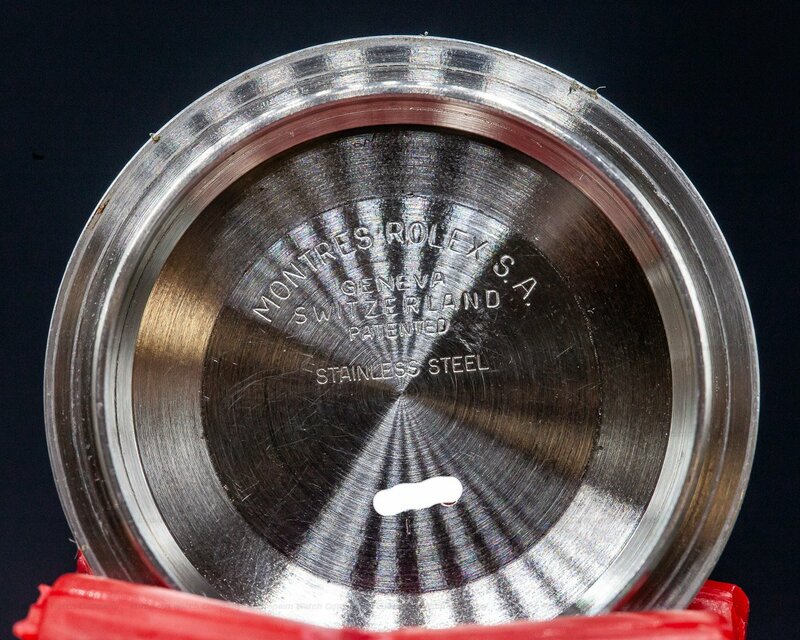 It's a Certified Official Swiss Chronometer (COSC), and the 12.5mm thick case, dial, and movement are all signed. 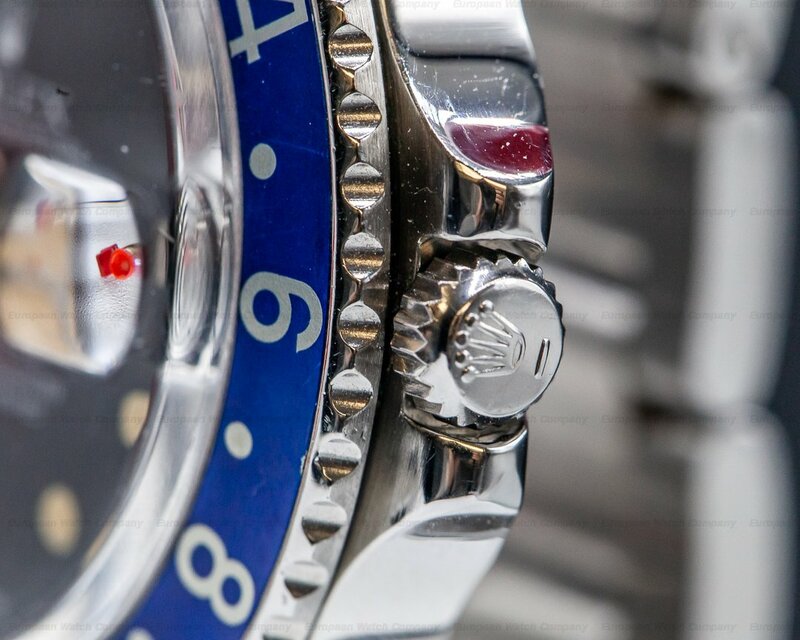 This Rolex GMT Master "Blueberry" 1675 has a mechanical automatic self-winding Rolex caliber 1575 movement that's rhodium-plated, with a shock absorber mechanism. 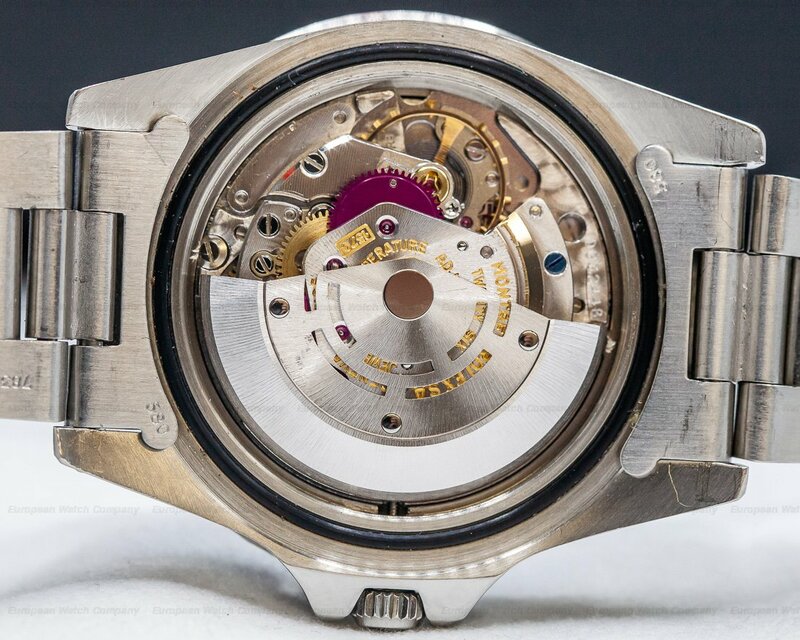 It's constructed with 27 jewels, a straight-line lever escapement, and a free-sprung monometallic balance that's adjusted to 5 positions and temperature. 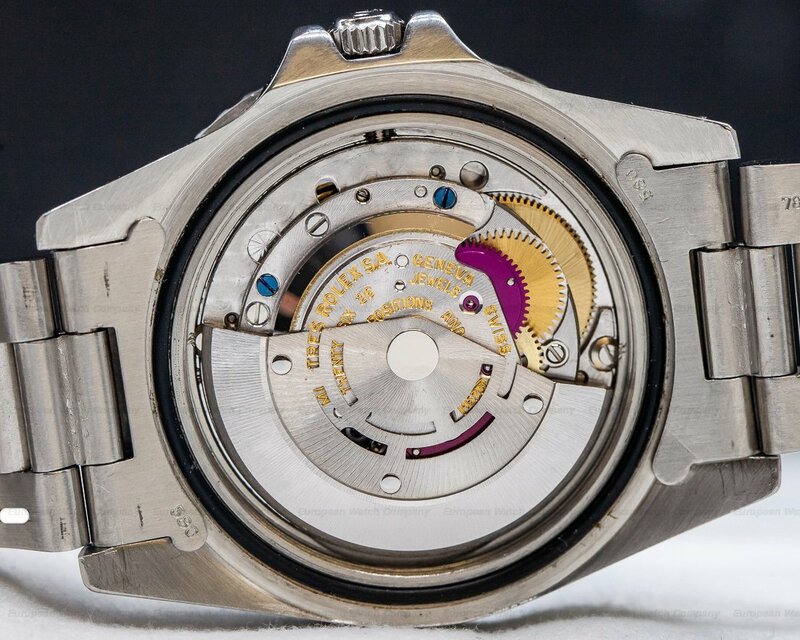 It includes a self-compensating Breguet balance spring, and Microstella regulating screws.